Specs: OD 6+ @ 690-1300 nm, OD13 @808nm specifically. For when you have gratuitous amounts of energy. For the record those OD3 @808nm laser safety googles are INSUFFICIENT for the power of this laser. I’ve ordered these glasses, which are OD 6+ @ 690-1300 nm, and are OD13 @808nm specifically. This is 10,000,000 X the protection of the OD3 glasses. They are also glass which can withstand a direct hit much better than polycarbonate. Shout out to my peeps. In my research, I found the back story to the lasers I picked up. 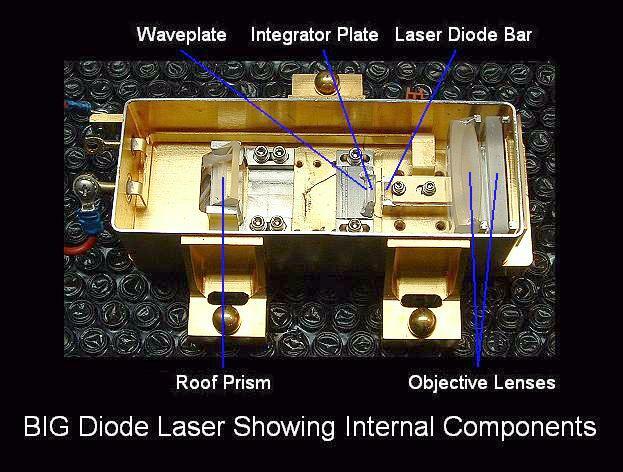 Looking at the beam path illustration, these units correct for some of the diode array’s problems with divergence and astigmatism, so the output of the diode is a rectangular beam that focuses to a 1.5 cm long line about 15 cm beyond the output aperture. So we are working with a well columnated beam, but it’s rectangle, not a circle. I think the easiest route to a top hat beam would be to focus this bar beam into a single thick core multimode fiber optic cable which results in a perfectly circular Gaussian spot, and an easy way to deliver the beam to it’s target where it would pass through a simple circular focusing lens. Challenges include sourcing the correct fiber optic cheaply, cleaving the fiber optic correctly, and aligning and focusing the bar beam into the fiber optic. This process would benefit from a Laser_beam_profiler, so you can find the sweet spot with focus and alignment for max transmission through the fiber. Here is a good overview of the basics of laser welding, including weldability of various materials. The labels are a bit ambiguous for the electrical connection. Is the chassis the anode, and both leads on the top the cathode? I think this must be the case. Poking around with an electrical multimeter, I find there is almost no resistance between the two terminals on top. But when you test between the either of the terminals and the chassis you get a different resistance depending on the direction of the test, which is from the diode’s electrical bias. Here is the full setup. And the verdict? Success! Here is a video of the setup, and a video of the trial run.